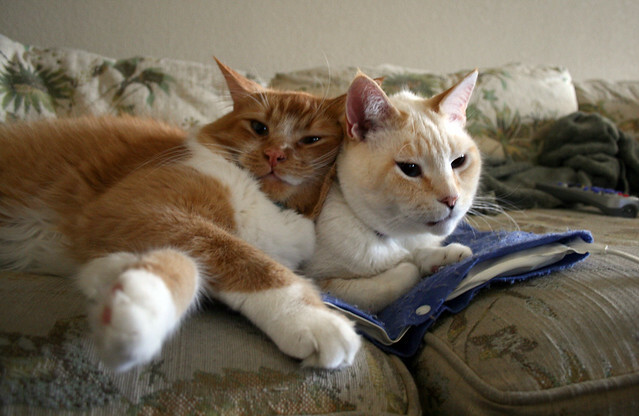 Could Your CH Cat Benefit From A Heating Pad? The other day Kelly sent me an update about her CH cat, Von: She and her vet decided to experiment with heat therapy to see if it would help Von’s mobility. Two or three times a week Kelly places a heating pad on Von’s hips and back legs for about ten minutes at a time, while taking occasional breaks. She says Von has been very receptive to the heat therapy. “Von loves it! She’s starting to stretch her legs, and [it’s] helping her put her legs back into a “normal” position,” Kelly says. Heat therapy, also known as thermotherapy, relaxes muscles by improving blood flow, increasing tissue extensibility (stretchiness), and alleviating spasms. This relaxes muscle tone and can improve mobility. It can also help alleviate pain by adding a competing stimulus to the area, which blocks out the pain. It’s important to inject here that heat is *not* recommended for acute injuries, that is, anything that leaves a sudden pain, swelling, etc., or after exercise. Before you start a heat therapy routine, speak with your vet to make sure it’s the right option for your pet. There are several ways you can apply heat therapy, and your vet can help you choose which option is right for your cat. For example, one method is to take a damp towel and place it in a hot clothes dryer or a microwave for a minute or two. You want the towel to feel hot, but not uncomfortably hot. You can test this by placing it on your inner wrist. Let it cool a bit if necessary. Once it’s the right temperature, fold it or wrap it around your pet’s affected area. You can insulate it by placing another towel on top. Apply heat for ten to 15 minutes, then wait at least another 15 minutes before reapplying. Check with your vet before you use an electric heating pad on your pet. Some may not recommend them for cats, however, there are other options out there, such as microwavable heating pads. One brand is called Snuggle Safe. The pad can be heated up in a matter of minutes, and it claims to provide safe, gentle heat for up to ten hours. You may also want to look into heated beds, which you can find at most big pet stores. Again, before investing in any option, speak to your vet about the options above to see which may benefit your pet most. To find a CH friendly vet close to you, check out this map. sounds like a great option! I don’t like the electric pad either…. too easy to forget about.